Alex Thuku takes colour to the streets. An unassuming alleyway on Blowers Street has been converted into a tropical wonder world by Alex Thuku's new mural. Filled with exotic leaves, flamingos, elk and lemurs, fantastical shades of yellow, turquoise and pink define the landscape. This scenery spanning the side of Blue Apples Arts and Wellness Centre (formerly The Blowers Street Paper Chase) is easy to get lost in. "Something about being outside and painting is very liberating," says Thuku, as he looks up at his finished work. Throughout the past month, he spent days working from noon until sunset to complete this large and vibrant work of art. Thuku is a NSCAD student, well-known in the city for his portraits of people and whimsical animal paintings. The seasonal weather—and a break from school—led him to trying out street art. After raising the money to create this piece on GoFundMe, he approached the owners of the building, asking permission to use their concrete wall as his canvas. They were into it, and the rest was magic. "I love studio work," says Thuku. "But after a while, especially in the summer, it's nice to be out...to see people, meet people, and breathe fresh air." The downtown project was Thuku's first street piece, though it won't be his last: Look for his signature colourful circles (resembling bullseyes) on both Queen and South Park Streets. 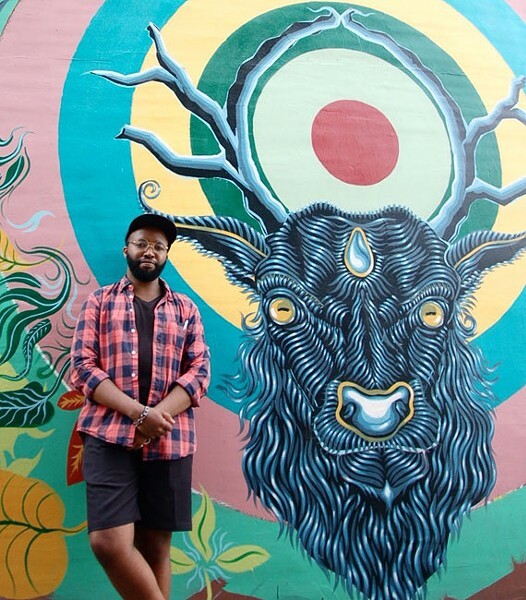 One mural at a time, Thuku wants to brighten the city.